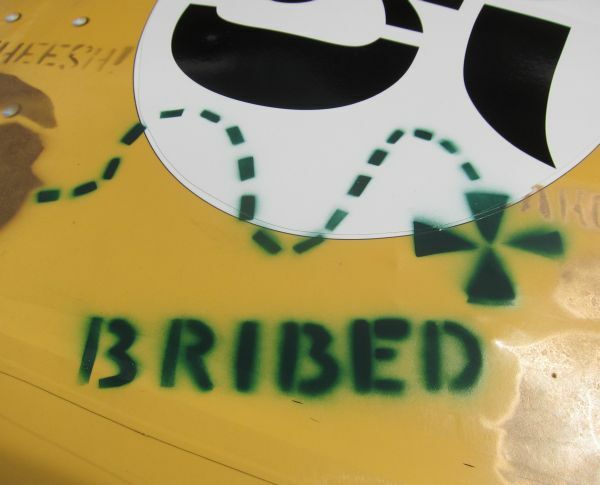 The LeMons Supreme Court has been through many versions of the BRIBED stencil (applied to the cars of teams that grease the wheels of justice with a gift for the LCS) during the last five LeMons seasons. Lately, we’ve been trying to make each stencil more of a commemorative-edition souvenir for each event. Collect them all! 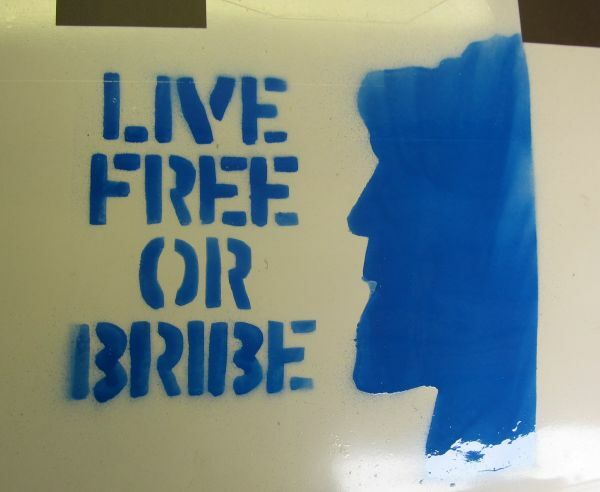 Above, we see the “Live Free or Bribe” stencil that adorned vehicles at the Loudon Annoying race in May. For the 2011 Yeehaw It’s Texas race, I made this stencil showing the track’s location on a map of Texas. That seemed like such a good idea that this stencil showing the location of the Campaign To Prevent Gingervitis on the map of Michigan was broken out at the April Gingerman race (yes, I know the UP is missing, but you try cutting that shape out of a 12-pack box with a razor blade). Since I didn’t get around to making this stencil until Saturday night, only a few cars got sprayed with it. 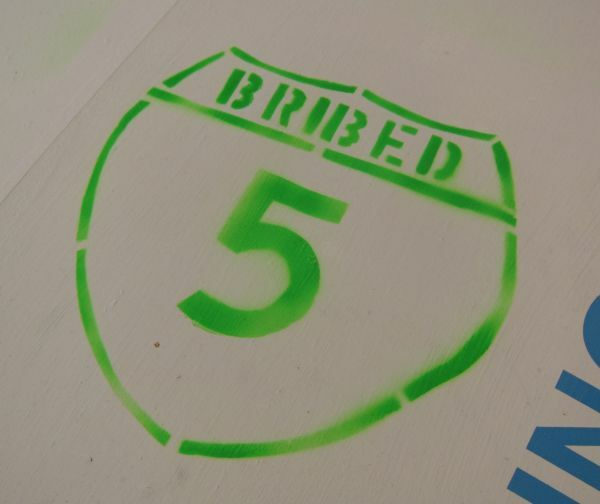 One of the rarest BRIBED stencils in LeMons history! 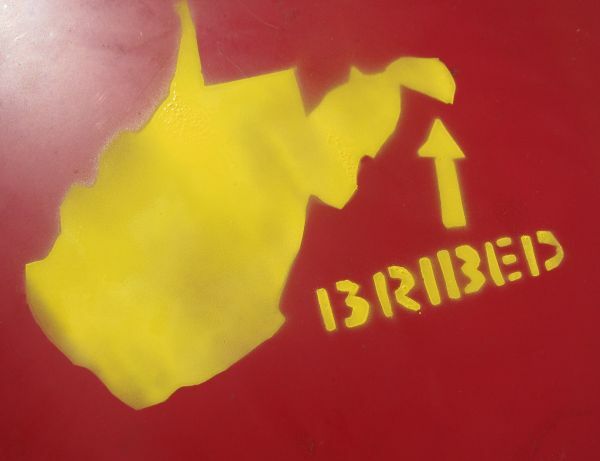 The location of the Capitol Offense race was on a part of the West Virginia map that made a star showing the location very hard to cut with a box-cutter knife. We used an arrow instead. 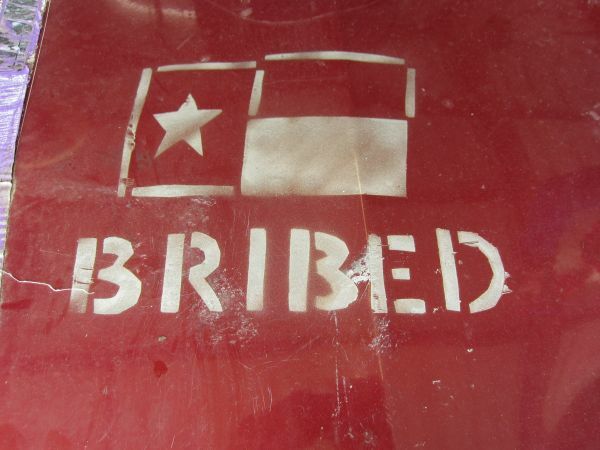 Since we race at several Texas tracks, I thought that a Texas flag stencil would be useful at more than one race. 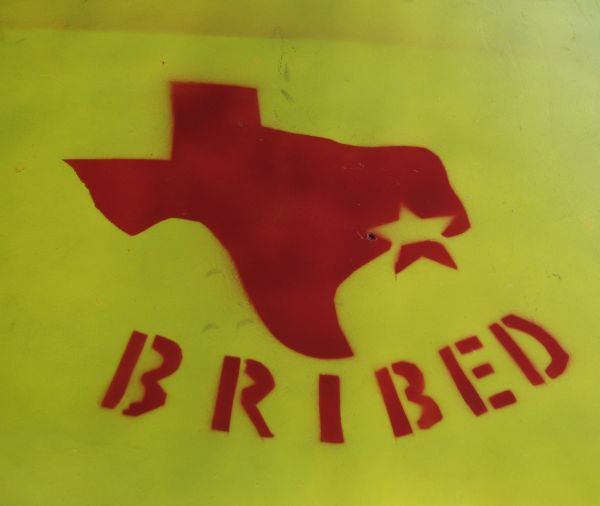 So far, however, this BRIBED stencil has been used only at the Yeehaw It’s Texas 2012 event, held at Texas World Speedway in February. 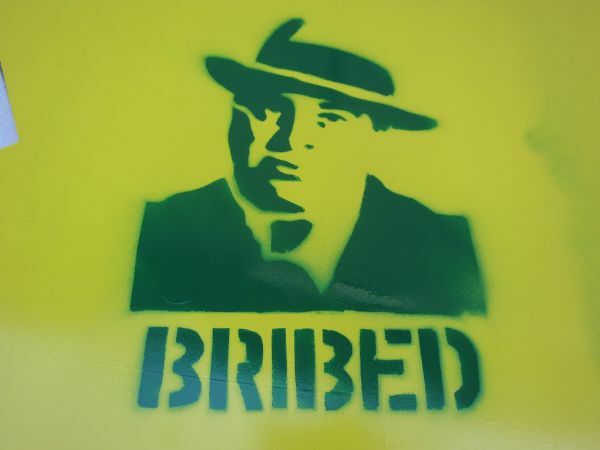 For the Showroom-Schlock Shootout near Chicago, the face of Al Capone seemed appropriate for the BRIBED stencil. I wanted to go with the face of Merle Haggard for the Arse Sweat-a-Palooza race, but Merle’s face isn’t as distinctive as Al Capone’s. Instead, I went with the sign for nearby Interstate 5. The aptly named B.F.E. GP race requires hours of driving from anything approaching civilization, so I used the “treasure map” design from the event patch for the BRIBED stencil. 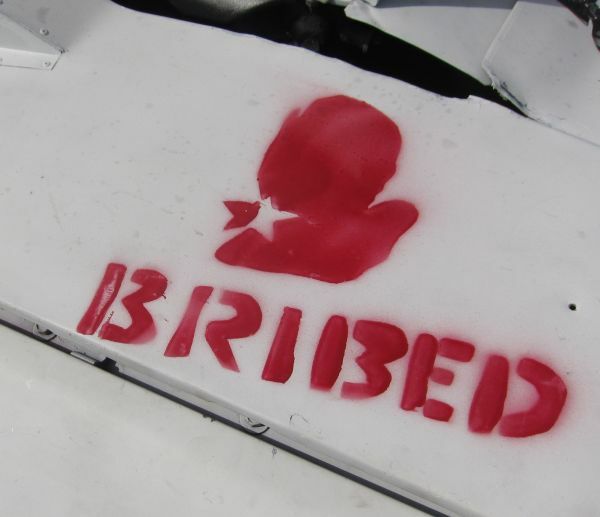 Sometimes racers bribe us with BRIBED stencils, in sort of a meta-bribe. 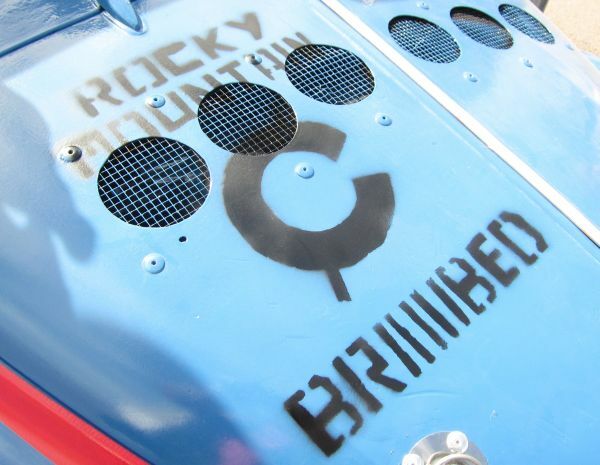 This “Rocky Mountain BRIIIIIIBED” stencil came courtesy of the IOE-winning Pacer team.